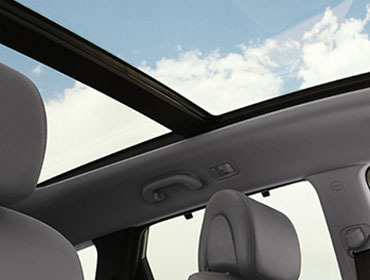 Sure, the panoramic sunroof gives you better access to the great outdoors. But it completely transforms the interior. Its shade can be adjusted to increase ambient light in the cabin or its glass panels opened up for added fresh air. And don't forget to pack your star chart. 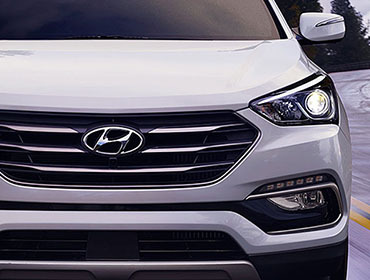 Good thing the standard seats in a Santa Fe Sport are covered in YES Essentials® premium cloth. It's stain resistant to make cleanup easier. Plus, this material has an antibacterial feature to help control odors and anti-static technology to help disperse the electrostatic charge that builds up as you enter and exit the vehicle. Available 8-inch display audio AM/FM/HD Radio™/SiriusXM with Android Auto™ and Apple CarPlay™. Automatic Emergency Braking is just one of a suite of available advanced safety features designed to actively make drivers aware of the seemingly endless developments and movement of traffic around your vehicle. Actions that you might be unaware of and if undetected could cause harm to you or others. This standard feature provides audible and visual alerts if a vehicle is detected in the driver's blind spot. In reverse gear, Rear Cross-traffic Alert warns the driver of vehicles approaching from the side. 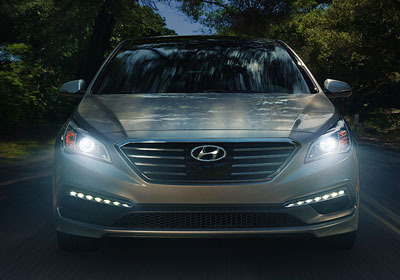 Lane departure warning lets you know when your vehicle is drifting out of its driving lane without signaling.